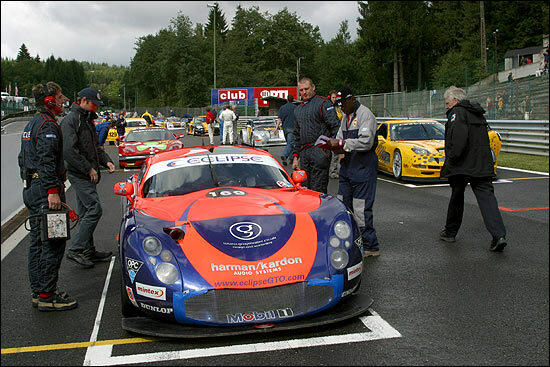 Spa-Francorchamps, one of the world’s truly great racing circuits, and Eclipse would be doing battle over up to six hours of racing to try to retain the lead in the 2003 British GT championship. With a grid of 21 British GT runners joined by a depleted (but still awesomely quick) selection of prototype racers from the FIA Sportscar championship, plus a Guest class featuring a trio of very quick GT cars, it always looked like being an interesting weekend. 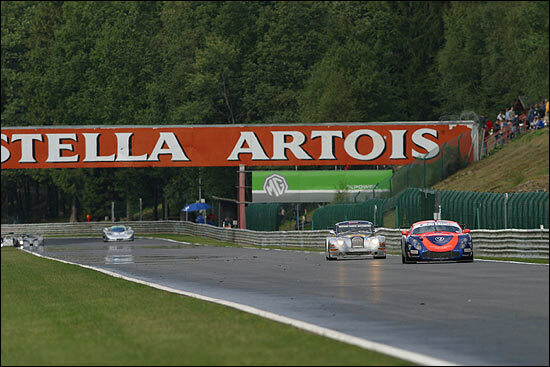 Sadly it was interesting for all the wrong reasons on Friday as the cars went out for free practice: the rains came down, Shane Lynch was tiptoeing around to the pits, and…he was hit squarely in the rear by an aquaplaning Porsche. It looked bad, but the ever-resourceful Eclipse crew worked miracles. By Saturday morning the car was ready to get back into the fray, the tank tape on the rear of the car and the badly dented rear diffuser displaying ample evidence that its continued participation had been far from a foregone conclusion. Shane’s description of the renumbered (for this race only) #169 T400R as looking “a little sore” was bang on the money, but she would run, and run fast. 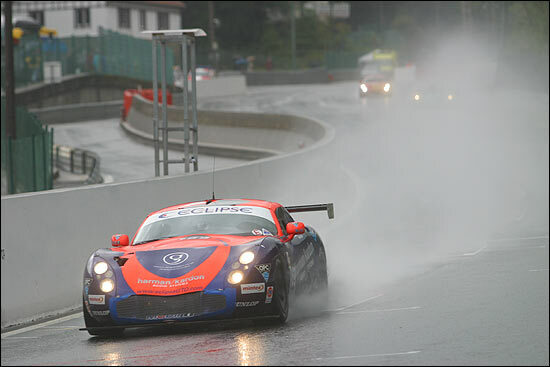 A torrential downpour left the Ardennes area just in time for the start of the GT qualifying session on Saturday afternoon. With so little track time a fight for pole was never going to be on the cards for #169. Up front then it was a battle between the Moslers and then four of the five TVRs, in the order DeWalt, DeWalt, Peninsula and Piers Johnson in the Eclipse T400R. No matter this was going to be a long, long race. Qualifying wasn’t that important: nothing like as important as for a typical ‘sprint’ race of 75 minutes. 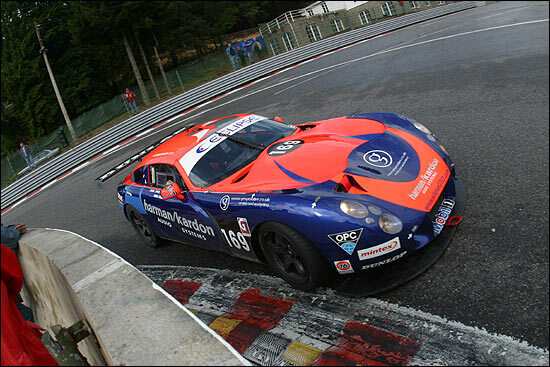 Simon Pullan – joining Piers and Shane for six hours of race action – had impressed the team no end by giving up seat time so that Shane, in particular, had a little more time in the TVR. “I didn’t think it was a very big deal, after all, I’ve raced here several times before, Shane hasn’t.” There’s a very level head on these shoulders. So in GTO Championship terms, the contenders lined up fist, second and sixth in class. With the Friday accident, Shane Lynch was still lacking track time on this daunting circuit. Wet or dry then? The surface was drying as they lined up, but although the line was virtually free of moisture, it wasn’t dry everywhere. Slicks it was then for all, but only for two or three laps. Piers started. The rain though poured down on lap three, and in they all came. The pit lane was crammed with cars, pit crew and marshals as slicks were discarded and wets were fitted all round. The Eclipse team had a relatively trouble free stop (it was as bad for everyone as the cars were manhandled into their pit bays and then edged carefully out again). With the rain still pouring and the pitstop chaos now settled, the order stabilised. 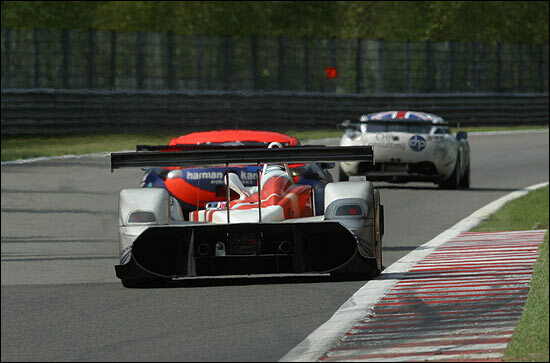 At 15 laps (or just over one tenth distance for the race-leading prototypes) the guesting ‘Pocket Panoz’ Gillet Vertigo was the leading GT car (sixth overall!) followed by Thomas Erdos in the Balfe Mosler, Cor Euser in the 650 bhp Marcos Mantara, Rob Barff was next up in the #192 DeWalt TVR with the guesting Lamborghini eleventh. Lee Caroline was enjoying his debut in the other DeWalt TVR, fending off Martin Short in the Rollcentre Mosler. Pat Pearce was flying in the lead of Cup while Piers Johnson was dicing with Dan Eagling in the Peninsula TVR for nineteenth overall, ahead of Nick Adams in the Damax Ferrari. Hectic stuff. Piers was having a torrid time though, in #169: “When we changed for wets the handling was just awful, major understeer on right handers and major oversteer on left handers.” This would turn out to be a six hour event in which the Eclipse men hung on as best they could. An additional hiccup had caused a few concerns in the Eclipse camp when the windscreen wiper failed during the worst of the weather. The car’s screen was liberally doused with the rather wonderful Rain-Ex and Piers was able to see, this isn’t the track where you want your vision impaired! Then the sun came out! And it would be the last we saw of significant rainfall. Eagling passed Piers, with both TVRs also finding a way past Pearce on a drying track. It was nip and tuck between the battling TVRs right through to the first fuel stops (a mandatory two minutes), Eagling handing over to Graeme Mundy and Piers to Simon Pullan (ready to go, above).. The stops came thick and fast, led by a suspect one for Barff’s TVR. 12 seconds quicker than the two minute minimum would result in a stop and go, no fault of Barff’s of course, but his TVR was still right in contention anyway, thanks to his wet pace – and a later stop for Erdos. Rob Barff was the class (and GT overall) leader at two hours despite his pit problems, 23 seconds ahead of the Gillet, 48 seconds ahead of Shaun Balfe and over a minute ahead of Martin Short. The Moslers were duelling hard, the gap first closing then eased out once more. Simon Pullan was having a good race with Graeme Mundy for fifth in GTO, but Eclipse were marooned in this position for much of the race, a sticking throttle further blunting any challenge for progression, with the drivers inability to heel and toe costing valuable time. Just over half distance and the Safety Car appeared for the first time. The ISL Mantis and the Clio were in the gravel at consecutive corners. The timing hurt the Eclipse charge badly, effectively putting the Peninsula car out of reach. The pace though would still be good enough for them to take their title challenge to the last race. A wheel gun failure at the stop to put Shane Lynch in for the finish didn’t do enough damage to put their position in doubt. Shane then had a cracking battle with the Corvette, a car well suited to the flowing Spa curves, Paula Cook finding real pace in the big yellow Chevy. Pullan was typically (and needlessly) self critical: “With hindsight I probably drove a 12 hour pace rather than a six hour one. The key though is the championship, get it to the end, get the points on the board and give the guys the best chance possible at Brands Hatch.” Quite right. Up front it was a fantastic race to the flag between the two warring Moslers, Guest drivers Erdos and Joao Barbosa staging a stunning duel which would only be settled on the very last lap, with the cars just tenths apart, before Erdos finally found his fuel tank dry. He would coast home for second, as the Rollcentre team took their first win of the season. The reliability of the GTO field was magnificent, just one car (the #191 De Walt TVR) failing to finish, a magnificent achievement for a race lasting nearly six hours, from a field more used to ‘sprint’ racing. After one of the best British GT races ever (perhaps the best), the points read Balfe Motorsport pair (Balfe and Derbyshire) 184 points, Eclipse’s Johnson and Lynch 180, and Rollcentre’s Herridge 179. It’s all to play for at Brands Hatch (25 – 20 – 17 – 15 – 14 etc.). Chris Pollard neatly summed up Eclipse’s fortunes. “We lost a lap under each Safety Car, but if you’d told me at the start of the season that we’d go to the last race with a chance at winning the Championship, I wouldn’t have believed you.” And all this after Eclipse’s nightmare Friday. 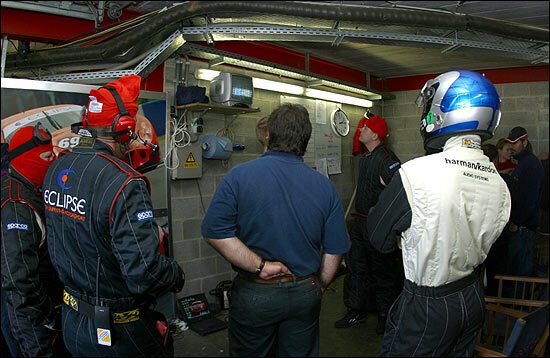 Roll on Brands Hatch and the deciding contest. It’s a Mosler pair vs. the prettiest TVR race car on the planet for the title and it’s all down to a 75 minute race on another of the world’s greatest circuits.